Night's OUT 10 - Let's go to the beach! Looking to get a tan? Looking to make a friend? 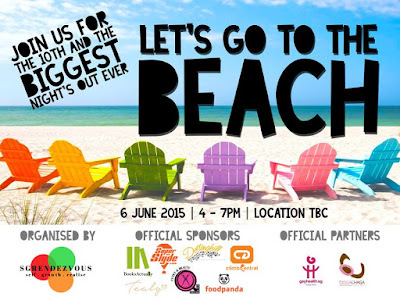 Come join SGRendezvous at our FIRST outdoor event! We're going to have some fun in the sun and we want you to be there! With Pink Dot just around the corner, it is going to be a perfect time to make friends for the picnic - all that while getting a dose of vitamin D. Everyone gets a big chance at walking away a winner from this one as we have goodie bags, team prizes and a lucky draw in store just for you. Note: This event is open to GBQ men age 18 to 25 years old only. Night's OUT 10 is proudly sponsored by Tealy, Cutey & Beauty, foodpanda, BooksActually, Superslyde, DottingHill and Climb Central. It is also supported by gayhealth.sg, AWARE and Oogachaga.